On a cold winter morning in Saratoga, an early slog out into the elements can always be rewarded with good food. How early? 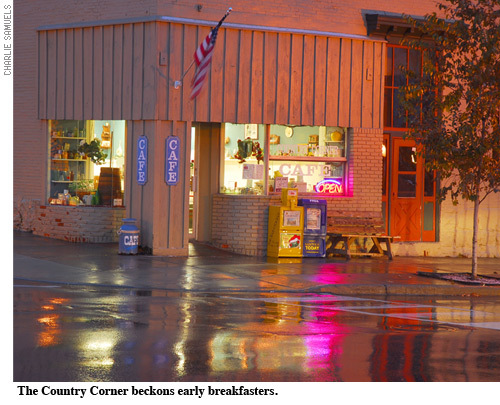 The Country Corner Café, at Church and Woodlawn, recently expanded into a new dining room, but its regulars seem happiest crowded into the brightly lit original space. In either room, breakfasters can enjoy fresh-squeezed orange juice, organic coffee, homemade jam, gorgeous red-skin-potato home fries. The fresh fruit bowl, served with honey yogurt sauce, granola, and a fresh-baked muffin or scone is $6.99; three slices of French toast made with the cook’s own cinnamon-raisin bread are $5.50. Check the board for creative daily specials such as potato pancakes with sun-dried tomato, basil, and bacon. The specials board is a must as well at Beverly’s, on Phila Street, where the menu ranges from comfort food to highly original creations. Eggs Beverly with smoked salmon and hollandaise is $9.95, pancakes with wheat germ go for $7.25, and the whopping “Skiddie”—three pancakes, three eggs, bacon or ham or sausage, home fries, and toast—is $11.95. A few miles south of town on Route 50 is the aptly named Fifty South, the latest culinary venture for Kim Klopstock ’81, owner of The Lily and the Rose catering firm. She serves breakfast all day in the relaxed and homey restaurant, with a menu enlivened by specialties like a $5 fajita wrap with two eggs, cheddar, and her own spicy olive tapenade. Continental breakfast fans can linger over melt-away muffins and Danish at the Bread Basket on Spring Street or savor the exquisite Viennoiseries (morning pastries) at the renowned Mrs. London’s on Broadway, where brioche, scones, and tarts range from $2 to $4 each. Mrs. London’s granola with fresh fruit and Seven Stars biodynamic yogurt is $5.50. An awe-inspiring gander at the world-class dessert creations in the glass case is free. Editor’s note: Tell us about your favorite Saratoga breakfast at srosenbe@skidmore.edu or 518-580-5747.